An overview of the Abacus process is represented in the flowchart below. A larger version is available at Appendix A. An overview of timeframes and authorisation levels for level 2 and level 3 matters is in the matrix below. A larger version is available at Appendix B. The registration process for all types follows the process at Receiving and Registering Complaints. Members registering a matter on BlueTeam™ will need to determine the appropriate category. 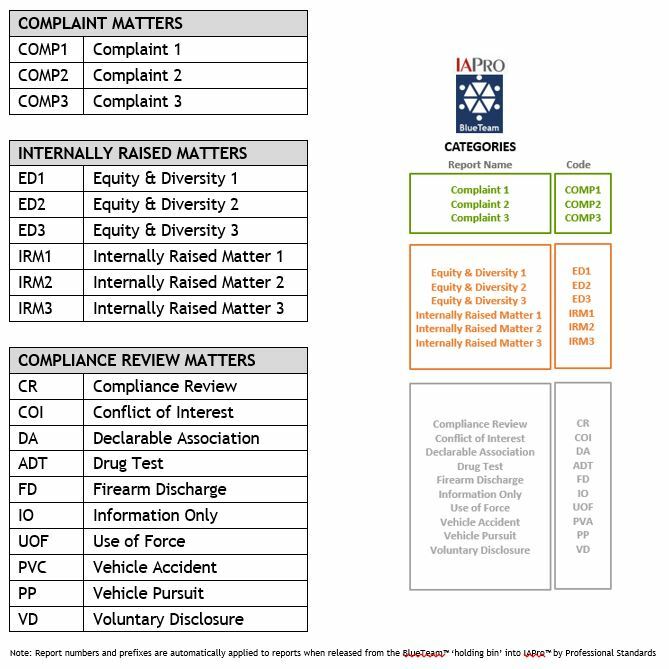 Once categorised the system only facilitates changes to categorisation within IAPro™ (which can only be done by Professional Standards), therefore if supervisors and managers validating the matter believe it should have a different category they should note this on BlueTeam™ as it is routed to Professional Standards. Managers have a greater responsibility in giving fuller consideration to the categorisation (refer Managers’ Responsibilities). Where any doubt exists Professional Standards can assist. The available categories are listed at 3.3. At any stage of the Abacus process (up to the point of members being informed of the Provisional Finding) matters may be recategorised on the basis of new evidence or information received. Reasons for recategorisation must be recorded on BlueTeam. If a matter has already been referred to a district for inquiry or investigation, recategorisation should occur in consultation with Professional Standards. This category is for minor matters which are dealt with by managerial resolution. If a matter involves an allegation that an offence, serious offence or crime has been committed it must not be categorised as a level 1 matter. Supervisors and managers are empowered to resolve level 1 matters immediately. External complaints of this category may be made via telephone and other informal means – a written complaint should not be taken. For a matter that constitutes a level 1 but involves repetition of a type of behaviour that has previously been reported, consideration must be given to categorising it as a level 2 because more scrutiny is required. Where supervisors do not have knowledge of the member’s conduct history they are to seek advice from their manager or Professional Standards. It is expected that managers would check EIPro holdings to provide advice or seek advice from Professional Standards. A written complaint is required for a complaint 2 or complaint 3, no written complaint is required for complaint 1 – just a BlueTeam entry with the complaint described on the summary tab. As level 1 matters are dealt with by managerial resolution, if they are based on a complaint they are ‘dismissed without an investigation’ under section 46(1)(b) of the Police Service Act 2003. This does not mean that they are dismissed entirely without any further action – rather, they are not dealt with as a potential breach of the Code of Conduct and there is no inquiry / investigation. The resolution process must involve the subject officer being informed of the allegation, however subject officers, complainants and witnesses are not required to submit written reports. Level 1 matters may be resolved by informal resolution with all the parties and, if appropriate, apology or formal resolution. Continuing professional development (CPD) opportunities should be considered. Procedural fairness applies to level 1 matters as with other matters. 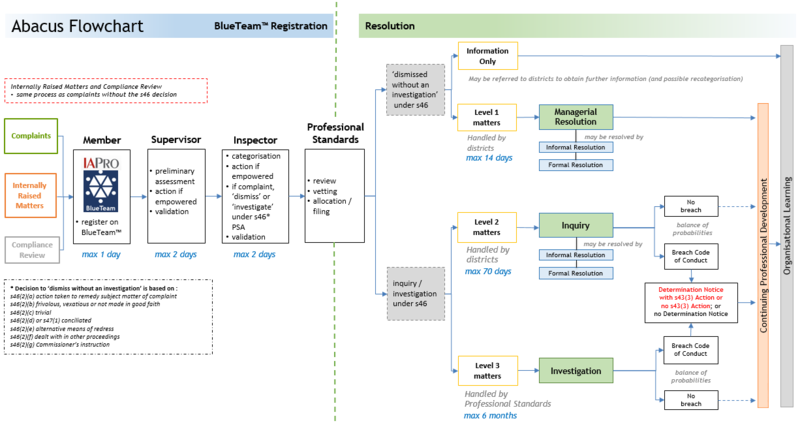 Where it is obvious the matter is level 1 and the member receiving the complaint is a sergeant (or above), they may resolve it immediately, noting the resolution steps on the BlueTeam™ entry. Where possible the direct supervisor or manager of the subject officer should deal with the matter unless an insurmountable conflict of interest exists. A maximum timeframe of 14 calendar days is applied to the resolution of level 1 matters. A timeframe extension is possible but should only be granted in exceptional circumstances. Professional Standards would only have carriage of a level 1 if they are able to immediately resolve a matter in response to direct contact from a complainant (e.g. complainant rings the Professional Standards office), or if it is intrinsically linked to a matter they are dealing with. These matters are dealt with as a potential breach of the Code of Conduct. They are more serious than level 1 or involve a repetition of a level 1 matter and an appropriate level of inquiry is required. Any matter that involves an allegation of an offence (e.g. traffic etc.) is to be dealt with as a level 2 matter. Serious offences or crimes are dealt with as a level 3 matter. Level 2 matters are not subject to the traditional investigation process; instead the level of inquiry and reporting is to be proportionate to both the circumstances and the potential outcome. A maximum timeframe of 70 calendar days applies to level 2 matters – by that time the subject officer/s are to receive the Provisional Report, unless the matter has been suspended due to external factors (e.g. a court process, external legal advice, etc.) or finalised in some other way (e.g. informal resolution or formal resolution). It is expected that, in the absence of external factors, level 2 matters will be completed well within the 70 day timeframe. If a Provisional Report cannot be provided to the subject officer/s within 70 days, and the matter has not been suspended due to external factors, the district undertaking the inquiry can seek a timeframe extension. Professional Standards would only have carriage of a level 2 matter if it is considered in the wider organisational interest or it is intrinsically related to a matter they are dealing with. The decision as to who has responsibility for inquiry into a level 2 matter rests with the relevant district commander. If the matter is routed to an inspector, that inspector maintains accountability for the inquiry and its outcome (within their delegated authority) unless an insurmountable conflict of interest exists. The inspector can delegate the matter to a sergeant to undertake the inquiry provided they are not the subject officer’s direct supervisor and the subject officer is below the rank of sergeant. The inspector’s accountability extends to ensuring that the enquiry is completed in a timely manner, that the parameters of procedural fairness are satisfied and that Abacus procedures are complied with. If the matter is to be routed to a member of a rank higher than inspector, that member has the same accountability as described above. These are serious matters and are dealt with as a potential breach of the Code of Conduct. If proven they may warrant termination of appointment and /or amount to a serious offence or crime. An appropriately extensive level of investigation is required and a maximum timeframe of 6 months is allowed for completion. If a Provisional Report cannot be provided to the subject officer/s within 6 months, and the matter has not been suspended due to external factors, the district undertaking the inquiry can seek timeframe extension. Where a matter satisfies one or more of the above criteria, but there is a compelling reason not to categorise it as a level 3, then written authorisation from the Deputy Commissioner or Professional Standards Commander is required. Level 3 matters are exclusively dealt with by Professional Standards except where the Deputy Commissioner directs otherwise. A subject officer’s direct supervisor or manager is not to undertake a level 3 investigation unless the Deputy Commissioner directs otherwise. The chapter Equity and Diversity provides information about legislation, roles and responsibilities and resolution processes. A list of categories is included with examples. Members’ Rights and Obligations apply to equity and diversity. Broader equity and diversity information can be found on the relevant intranet page under People and Culture. It is in the interests of all parties that matters are resolved in a timely manner. Timeframes commence on the date of receipt and registration of a matter. Adherence to timeframes are included in six-monthly reports to the Deputy Commissioner. Individuals and districts will be accountable for the achievement of the measurable time points. From the end of the measurable time points there may be other processes which are outside the control of the inquirer / investigator and authoriser and are therefore not measured (e.g. the subject officer’s response and, if they choose it, application for review, the court date of a linked matter). Extensions of time to complete a level 1 matter may be granted following written authorisation from the relevant district commander. Extensions of time to complete a level 2 matter may be granted following written authorisation from the Commander, Professional Standards. Extension requests must be submitted 14 days before the 70th day. Extensions of time to complete a level 3 matter may be granted following written authorisation from the Deputy Commissioner. Extension requests must be submitted 14 days before the expiration of 6 months. in addition to the delegation at 3.5.1 (above) determine the categorisation level of any Abacus matter. notify the determination of complaints to complainants and subject officers. The primary focus of Abacus is individual and organisational improvement. Therefore, most outcomes will include CPD. Only matters that result in a Determination Notice will form part of a member’s conduct history. 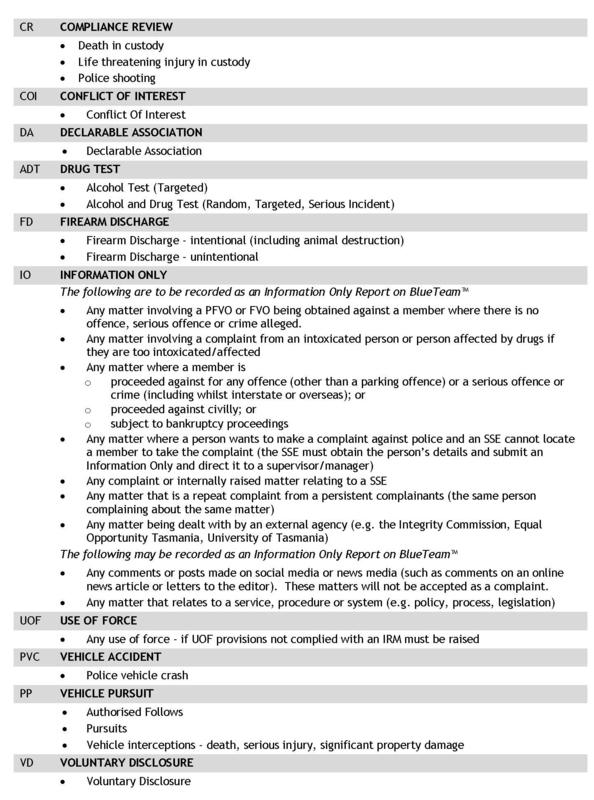 Under section 43(3) of the Police Service Act 2003, the Commissioner may take one or more of the actions listed under section 43(3) in relation to a member who has breached a provision of the Code of Conduct (levels 2 and 3 only). The purpose of section 43(3) Actions is to maintain public confidence, uphold proper standards of conduct and hold members accountable for their conduct. A discretionary decision may be made to not issue a Determination Notice for some breaches of the Code of Conduct – this is only an option when no section 43(3) Action is being taken. If the final determination is that a Determination Notice is issued the IAPro icon turns red. This means it forms part of the conduct history of that member and may be considered in any future breach of the Code of Conduct. Any section 43(3) Action of a reprimand or higher will affect the member’s eligibility for wearing or receiving medals. A Commander is able to impose a limitation on the subject officer wearing or being awarded the Commissioner’s Medal or National Police Service Medal for a period up to and including 12 months. An Assistant Commissioner or the Deputy Commissioner can impose a limitation on the subject officer wearing or being awarded the Commissioner’s Medal or National Police Service Medal for a period up to and including 5 years. Where the outcome is ‘No Breach’, ‘Breach + No Determination Notice’ or ‘Withdrawn’ the outcome will still be explained to the subject officer. Fairness and consistency in outcomes is assisted by 6-monthly reports to the Deputy Commissioner and the availability of Professional Standards to provide guidance. EIPro is a system connected with IAPro data that allows for early identification of members who have attracted higher numbers of complaints or attract a particular type of complaint within a defined period as compared to other members in the same work area. Early identification (EI) provides an opportunity to identify and, where necessary, address issues which may be affecting a member. The issues may relate to welfare or knowledge gaps. Addressing the issue and developing the member may prevent repetition of complaints or conduct matters; or the receiving of more serious complaints. If a member is identified, a qualitative review of those matters is undertaken by Professional Standards. If appropriate, a referral is made to the member’s district commander for consideration as to whether any professional development, welfare assistance or another approach is warranted. If any assistance is required, strategies should be developed in consultation with the member. The focus of EI is on identifying, rectifying issues and preventing further issue arising. EI is a CPD and not a Code of Conduct process. A key objective of Abacus is to move towards a strong focus on professional development. CPD is not an indication of wrongdoing – rather, a recognition that a member could benefit from guidance, additional training or viewing their own actions from a different perspective. The purpose of CPD is to develop the member. CPD must be appropriate and applicable to the identified conduct and to the member. It should be considered for every Abacus matter except those that result in termination of appointment. A CPD may or may not be a one-off event – the intention is to ensure that the improved knowledge and skills are sustained into the future. An IRM is raised about a constable repeatedly submitting late files and reports. It is managed as a level 1 and the managerial resolution is CPD of verbal guidance from their sergeant. Verbal guidance is intended not only to show the member how they are falling short of expected standards, but also to identify any underlying factors that are contributing to the problem (such as a welfare issue). The sergeant and constable devise a plan to address the underlying problem and agree to have future discussions to ensure that the problem has been addressed and the timeliness of their file submission is at an acceptable standard. Note: in these examples matters dealt with as a level 2 or 3 may also result in a determination that the member breached the Code of Conduct which may involve section 43(3) Actions. The Deputy Commissioner receives six-monthly statistical reports on the type, district and completion status of CPD. The Professional Standards Commander and Education & Training Commander liaise on additional requirements for organisational learning and professional development across the organisation. The intention of CPD is developmental. 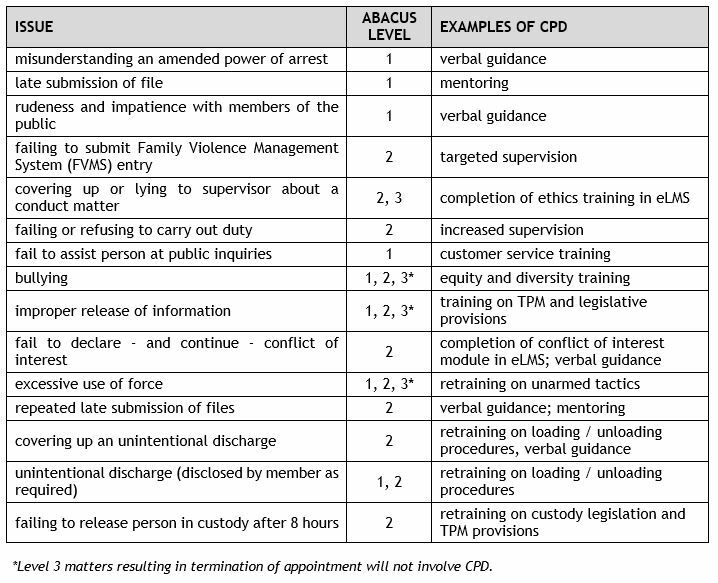 CPD implemented under Abacus cannot be used against a member into the future. Records or documentation relating to CPD are not available for any other organisational decision-making such as awarding of medals, selection for courses, transfers or promotion. CPD is not recorded as an adverse finding on IAPro™ and does not form part of a member’s conduct history. 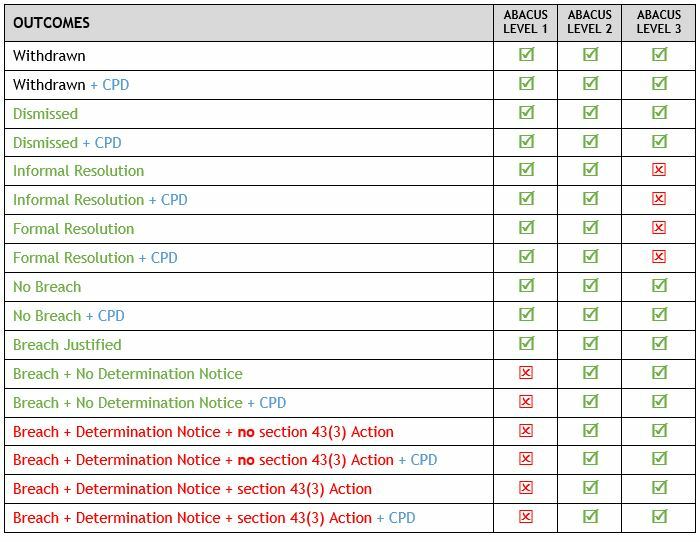 If a member fails to satisfactorily comply with any CPD within the allocated timeframe then the matter cannot be closed. The member’s manager must notify the relevant commander who has oversight of the matter for determination of further action, including whether or not to commence a new Abacus matter for failing to comply with a lawful direction. If CPD fails to reach the desired developmental outcome the member’s district commander is to consider an alternative CPD. Just as all members need to learn from personal experiences, Tasmania Police needs to be able to identify any opportunities for organisational improvement. It is important that this aspect is considered in every Abacus matter. For example, a training gap across the organisation may be identified or there may be a need for a TPM amendment. Organisational learning may also contribute to legislative reform. Organisational learning is further assisted from stakeholder surveys and data analysis described in Use of Information, Data Collection and Reporting. This page -- https://www.police.tas.gov.au/about-us/abacus/3-process-overview/ -- was last published on March 29, 2018 by the Department of Police, Fire and Emergency Management.